Whom Should You Rely on in the Cause of Peace and Salvation of Statehood? Several power centers were formed in Libya as a result of the fall of Muammar Gaddafi‘s Libyan Arab Jamahiriya and the destruction of the statehood. None of them has a national legitimacy. The pursuit of personal interests by some political leaders to the detriment of the general state is intertwined with territorial fragmentation. The historic regions – Tripolitania, Cyrenaica and Fezzan – have de facto separated from each other. 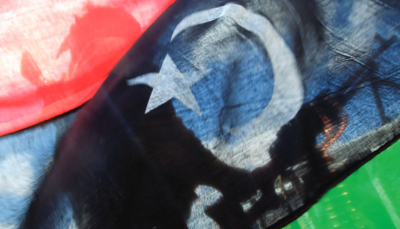 The Libyan phenomenon of the city-state arose (Misrata, Al-Zintan, Sirte, etc.). The separatist tendencies of the tribes grew stronger. Along with it, the UN attempts to stabilize the situation in the country. In December 2015, the United Nations brokered the Libyan Political Agreement (LPA), the Presidential Council (PC) was set up and a Government of National Accord (GNA) headed by Prime Minister Fayez al-Sarraj was formed. The agreement also confirmed the legitimacy of the House of Representatives (HoR) based in Tobruk in eastern Libya with the support of Field Marshal Khalifa Haftar, the Libyan National Army (LNA) commander. Despite the UN efforts, however, the conflict between Islamist, Anti-Islamist, secular, tribal and simply criminal groups which resulted in another civil war is caused by historic, social, economic and political circumstances including the interests and interference of foreign parties. NATO involvement in contravention of UNSC Resolution 1973 only turned Libya into a perfect place for terrorist and extremist groups, a center for human trafficking and cheap resources market. Today, the country is de facto divided by the East-West axis. The eastern regions are under LNA control. In early July, Marshal Haftar’s troops recaptured Benghazi partly stabilizing the situation in the East. Meanwhile, in the West, the tension between the groups allegedly supporting Fayez al-Sarraj’s Government of National Accord and those who were loyal to Khalifa al-Ghawil‘s Government of National Salvation grew into violent clashes. Rival militias have been battling heavily against one another in Tripoli since December 2016. 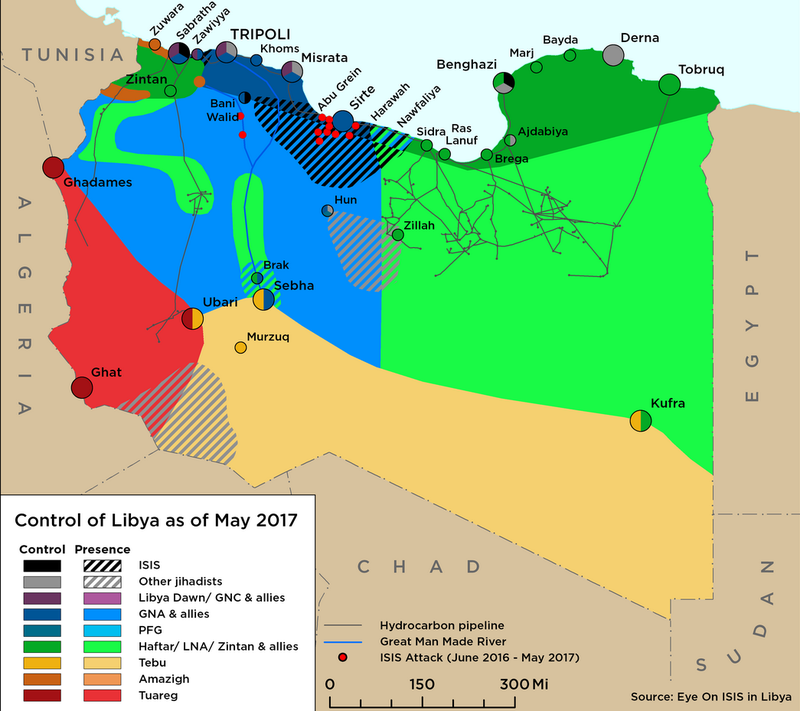 The South of the once rich and beautiful country became a battlefield of the eastern and western sides, tribes and terrorists where Haftar’s supporters were slain by the Misrata-based Third Force militants in early May 2017. The crisis is aggravating because of various Salafist jihadi groups with different ideologies that are in constant conflict in western Libya. Such groups include Libya Dawn (Libya Fajr), the Benghazi Revolutionaries Shura Council, Ansar al-Sharia, the 17 February Martyrs Brigade, the Libya Shield Force, the Libyan Petroleum Facilities Guard (PFG), etc. However, the West, Saudi Arabia, Qatar and Turkey possess more powerful tools in destabilizing the region e.g. ISIS, al-Qaeda in the Islamic Maghreb (AQIM) and the Muslim Brotherhood. A key part in counteracting IS and AQIM belongs to general Haftar who is taking measures to eliminate jihadists on the Libyan soil, near Sabha and Sirte cities in particular. Having lost Sirte, the terrorists dispersed in three directions: to the southwest of Sabha, to the west of Sabratah and to the southeast near the Sudan border. The main problem of neutralizing the groups is that they are being reinforced with volunteers from Tunis, Algeria, Mali, Chad and Nigeria and the terrorists fleeing from Syria and Iraq. However, while the situation in the east has stabilized, the western regions are less stable and prone to changes. Mostly, this is tied to the lack of political will of Sarraj and the GNA, and to the diversity of the ultra-conservative Salafist groups in the west. Although these opposing factions are nominally loyal to Prime Minister Saraj, experience has shown that they are not associated with any political leader. The most telling example is when at the end of October 2016, the forces of Haitham Tajouri, who heads Tripoli’s largest militia and who was allegedly loyal to the Government of National Salvation, allowed the units of Khalifa al-Ghawil to seize a number of ministries in Tripoli. There is also a question of the legitimacy of supporting these essentially terrorist formations by Fayez al-Sarraj. Probably, the latter uses them as a force capable in the future to counter the rising popularity of Khalifa Haftar among the population of Libya. Unlike Prime Minister F. Saraj, Marshal H. Haftar is a serious military and political figure on the Libyan chessboard capable of uniting tribes and clans under his banners, limiting the flows of illegal migration to the EU, liquidating the terrorist organizations like ISIS, AKIM and Muslim Brotherhood, thus restoring the statehood in the country.